Burlington--University of Vermont (UVM) Extension’s Center for Sustainable Agriculture recently was awarded a $248,900 grant for its programs focused on farming and climate change. UVM Extension was one of nine recipients in the country to receive funding through the Agriculture and Food Research Initiative (AFRI) Program of the U.S. Department of Agriculture's National Institute of Food and Agriculture. AFRI, authorized by the 2014 Farm Bill, manages a competitive grants program for education, Cooperative Extension and foundational and translational research projects in the food and agricultural sciences. 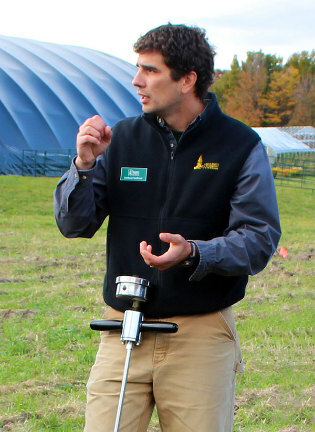 According to Joshua Faulkner, the center's Farming and Climate Change Program coordinator, the money will be used to develop a climate adaptation fellowship curriculum to help educate and prepare farmers and foresters in the Northeast for the challenges that climate change will pose for their businesses. "The curriculum will be unique," Faulkner explains, "in that it will utilize farmer-leaders for peer-to-peer learning in local agricultural communities to improve knowledge sharing. We know how powerful farmer-to-farmer learning can be, and we want to harness that power to improve climate change resilience for farms and forests." The project will be co-led by the USDA Northeast Climate Hub. Rachel Schattman, a UVM Extension research specialist who works with vegetable and berry growers, and Ernesto Mendez, a UVM plant and soil science associate professor and head of the UVM Agroecology and Livelihoods Collaborative, will collaborate on the project. Other partners include Cooperative Extension, research, agency and NGO (non-governmental organization) representatives from throughout the Northeast as well as farmers and foresters from around the region. "This program, once delivered, ultimately will help build more resilient farm and forest businesses through reduced pest damage, improved yields, effective water management and improved risk management," Faulkner says. "It will help conserve soil and water resources and help land managers of agricultural and forest land plan for and adapt to climate change." Established in 1994, UVM Extension's Center for Sustainable Agriculture provides timely information to Vermont communities and the UVM campus. Staff members conduct innovative research, support the development of promising practices, cultivate partnerships and inform policy to advance sustainable food and farming systems. To learn more, call (802) 656-5459.